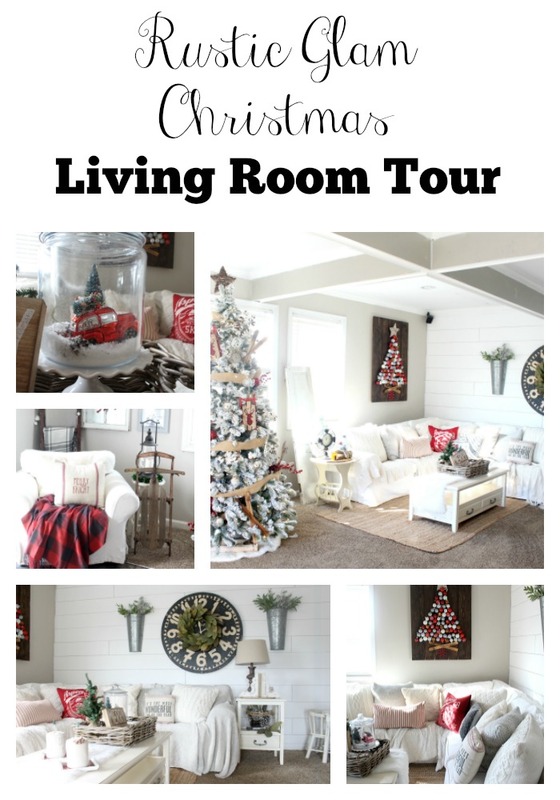 I'm so so excited to be sharing my Christmas Living Room Tour with you all today! Along with a group of some of my favorite bloggers. 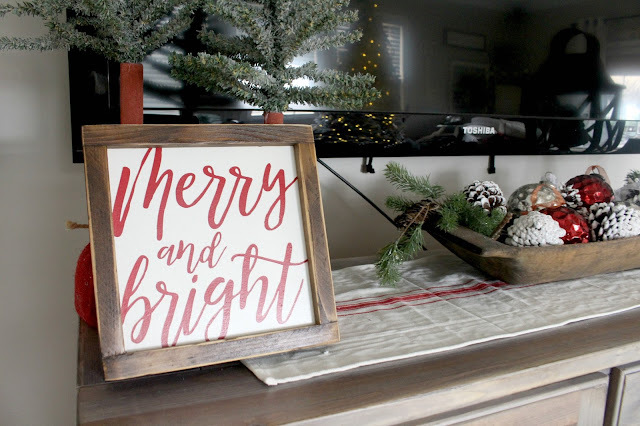 When I started decorating for Christmas in early November, I really didn't have much of an idea as to which direction I wanted to go, but I was finding myself super drawn to the reds of the season. Which is sort of odd, because if you've been hanging out her for awhile you know that red isn't typically "my thing". 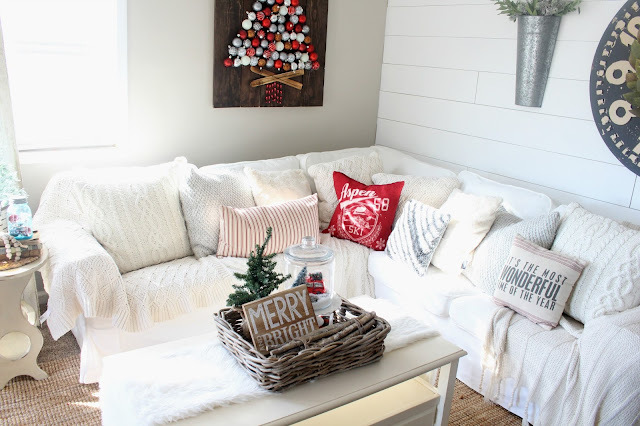 But I was really aiming for a Cozy Rustic Christmas and well, things just sort of started coming together after I picked up some new pillows and some goodies from Target Dollar Spot. So come on in, sip some hot cocoa and take a peek around! I hope you enjoy this little tour, as much as I enjoyed putting it together for you! Our living room one of my favorite rooms in the house currently, especially since we put up our faux shiplap wall (more on that later.) 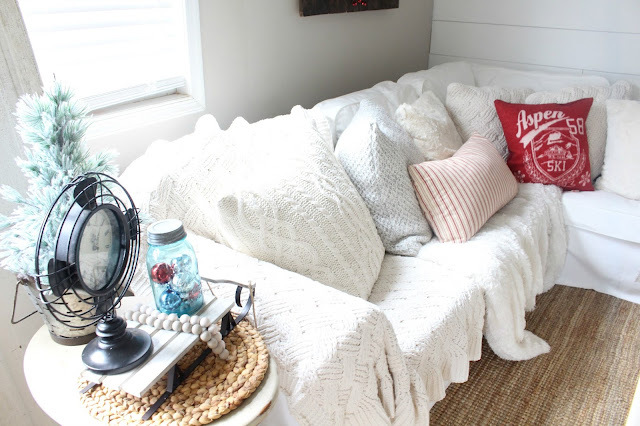 It's super cozy and we (obviously) spend so much time here! While I do have hopes of ripping up the carpet and replacing with hardwood someday soon, it probably won't be a project we tackle until after Christmas. I really have an obsession with pillows and throw blankets, but that's no secret. 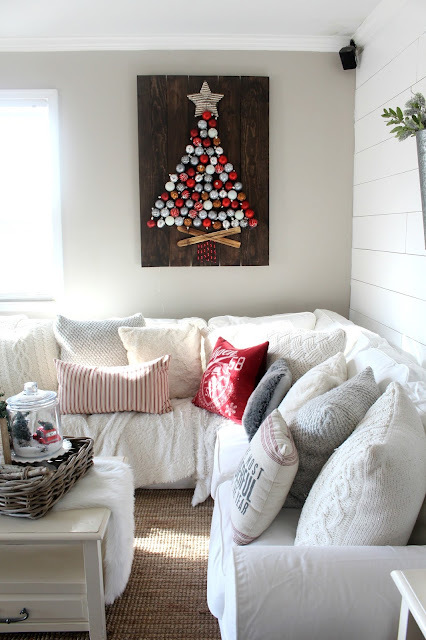 I shared some of my absolute favorite Christmas Pillows in this post here. This little red 'Aspen' pillow I picked up at Home Goods is really the one that started it all. I loved the coziness of it and it is what later inspired me to aim for a 'Ski Lodge' Theme. 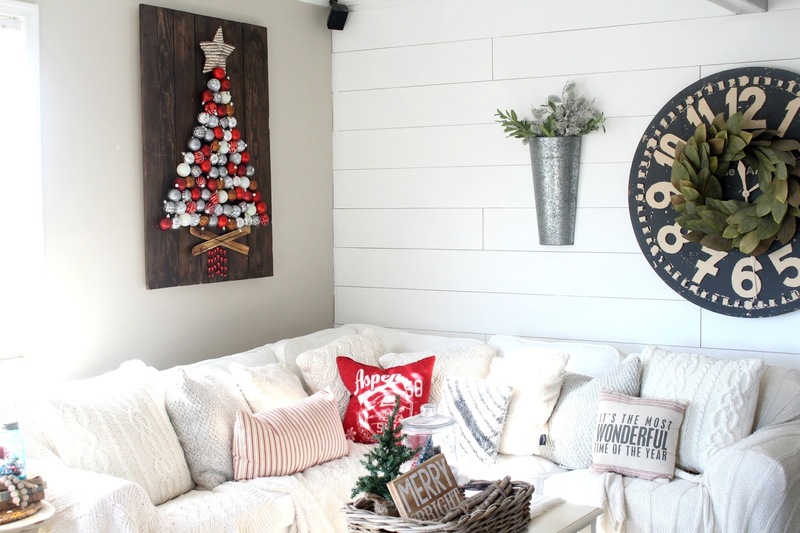 Incorporating little bits of red in this space, easily transformed a neutral space into a Cozy Christmas wonderland! 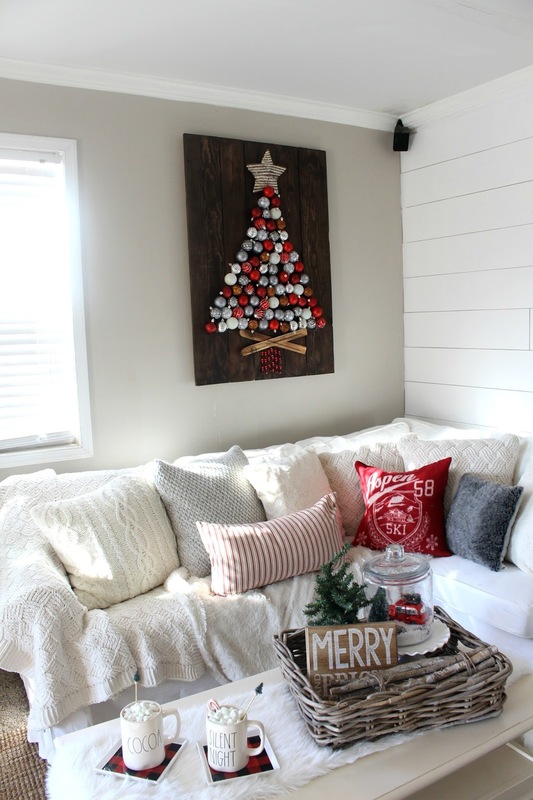 I truly think adding red to a space is one of the most simple ways to add Christmas Cheer to your decor. I know it can be scary if you love neutrals like me, but try it! You might be surprised at how much you love it! 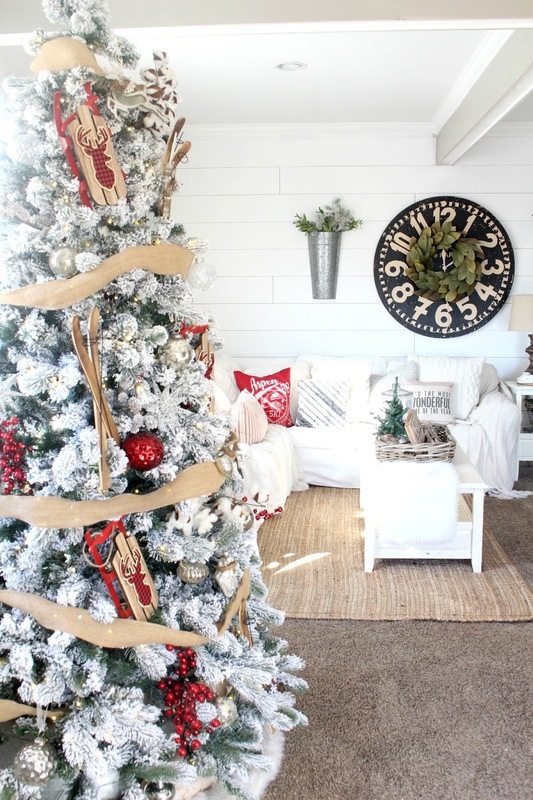 I am absolutely obsessed with flocked trees! 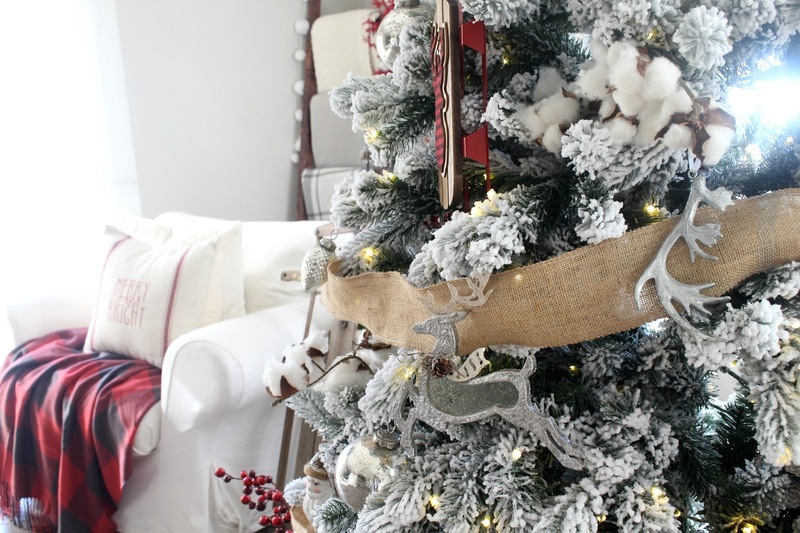 I shared some of THE BEST Flocked Trees for under $300 here if you're in the market for one! It's so simple and beautiful and I love not filling it up with tons of ornaments because I want to show off the gorgeous tree itself. So I kept things simple with some mercury glass ornaments and added some pops of red with my DIY Target Dollar Spot sled ornaments. I shared more details about my tree here if you want to check it out. You guys know I love my dough bowl! 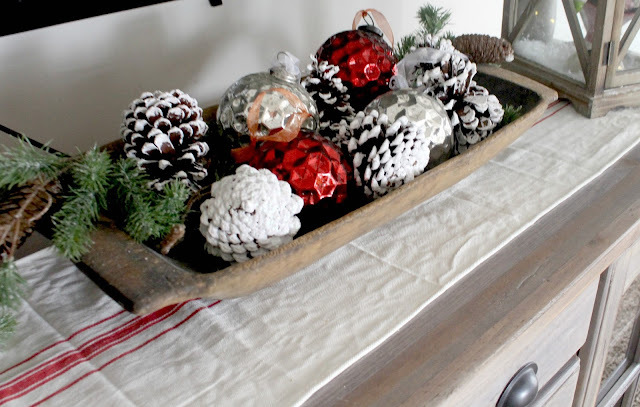 I snagged this one at one of my favorite antique shops and I love displaying it with different things for the seasons, in the Spring and Summer it usually holds Hydrangeas, in the Fall, Pumpkins and in the winter it's been a mix of things, this year I decided to use it to display some extra ornaments and greenery. 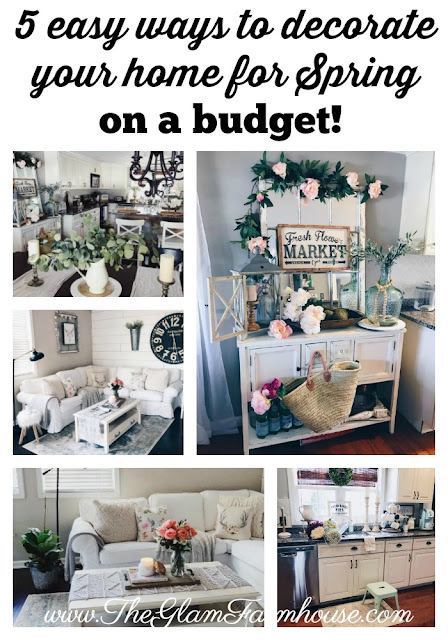 I was so excited to find this entertainment stand at Home Goods after searching for one similar for a few months. 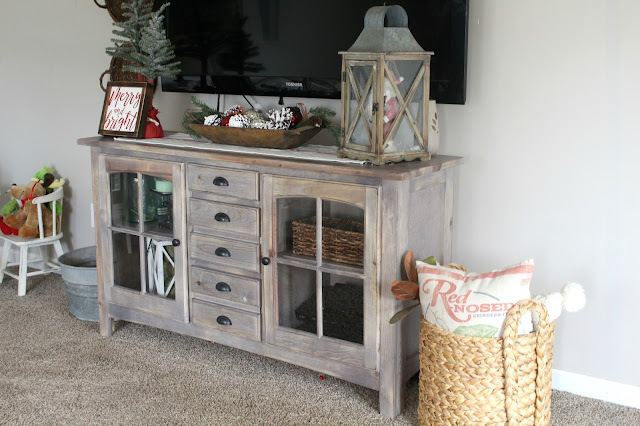 I loved the rustic gray wash- while I secretly wanted white, Nick encouraged me to buy something besides white for the living room, and I'm so glad I did! While we do have a playroom, Savanna still always ends up in the living room. I was so excited to find this little vintage antique kids table! It was perfect for our living room. She often sits here and colors, or does puzzles and reads stories. 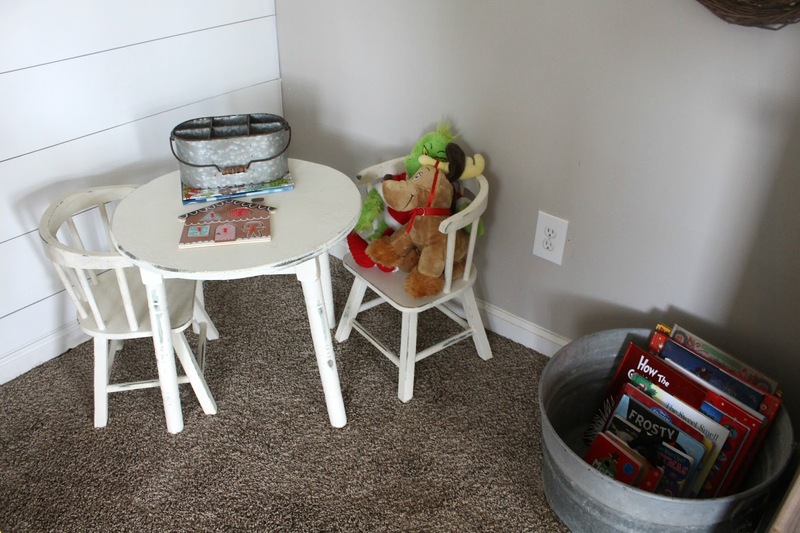 I love keeping a bucket of seasonal books out, and this little vintage galvanized tub is just perfect for holding our books that make it out of the playroom. 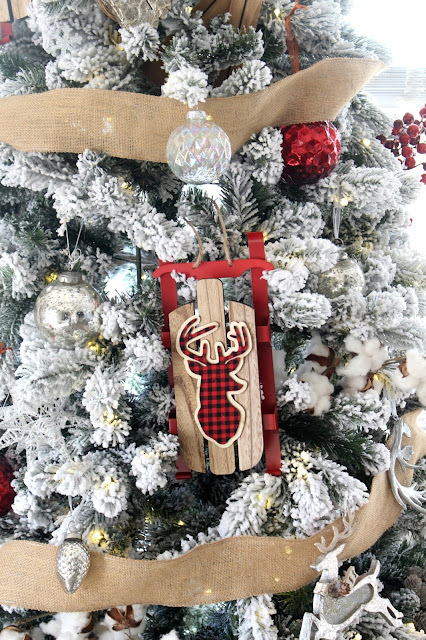 The Ornament Tree was a DIY project, and you can see how we did it in this post. It was super easy and really fun, just time consuming! But a great Holiday Project- none the less. Who knew color could be so much fun! I hope you enjoyed the tour today and are prepared for many more to come;) What do you guys think about my take on Christmas this year? I would LOVE to hear your thoughts! Shoot me a message on Instagram, Facebook or leave me a comment below. It always makes my heart happy reading your comments! Happy Tuesday! 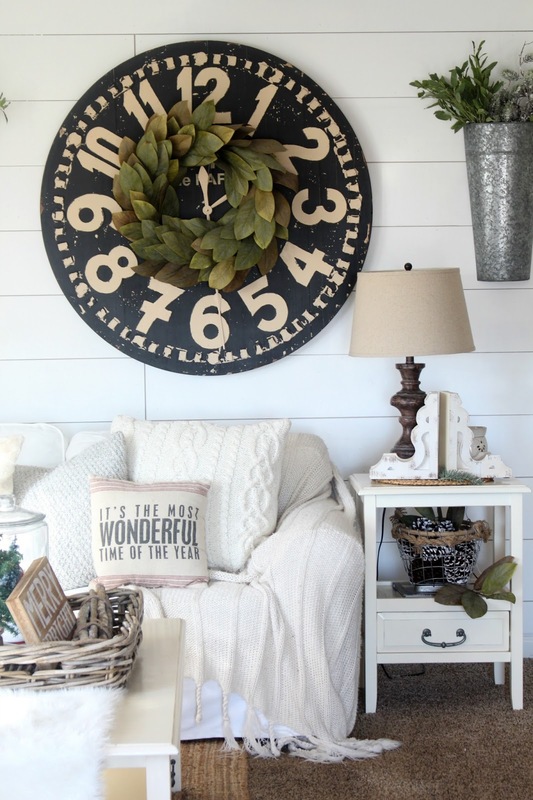 Now hop on over to see some AMAZINGLY decorated living rooms! 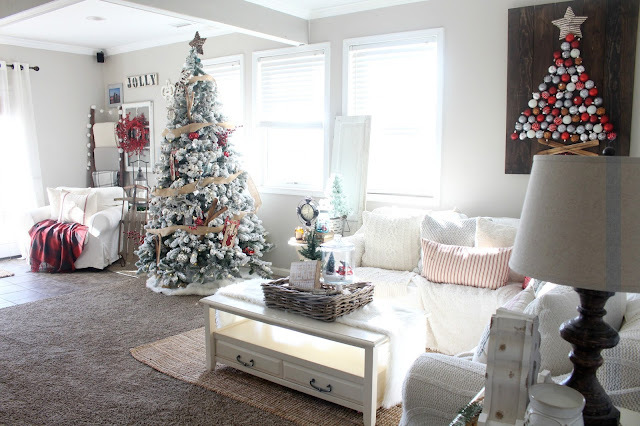 Such a pretty, inviting space!! Love the pops of red! I made one of those Home Depot DIH trees too and it's so huge I literally have no place to put it!! LOL! 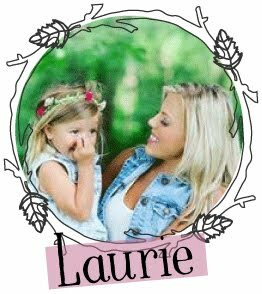 Oh Laurie, it's so dreamy! I've seen most of the room in bits and pieces on IG, but it was nice to see it all come together in one post. 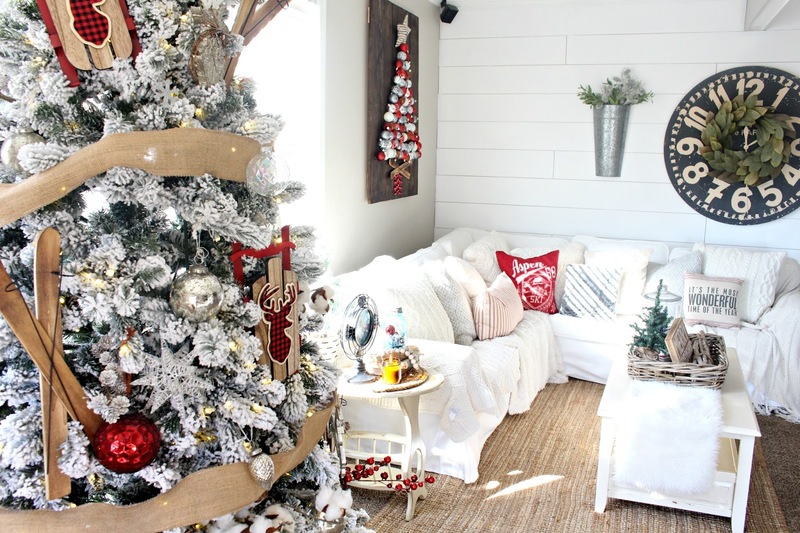 And it makes me want to change my Christmas colors to red, white, and silver next year! I love how bright and cozy your living room is. 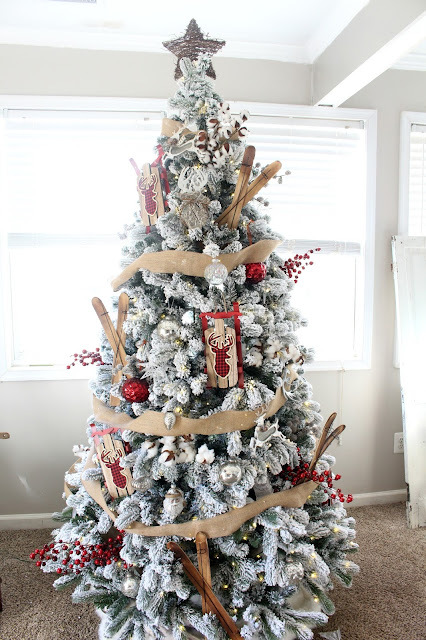 You did a fantastic job on your tree and I love the pops of red!! I was juuuuust about to ask you about your shiplap because I thought it was new! Turns out I was right! Love love love it! I'll be sitting my tail right in front of the tv tonight for the new season of Fixer Upper! And I love the Aspen pillow! And well, the entire room!! 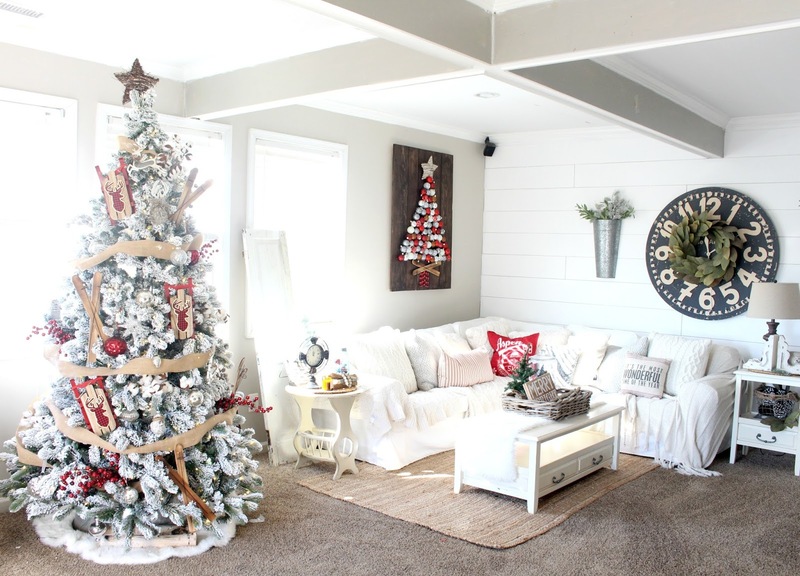 Your living room is wonderful and I love your tree! So pretty! I love all the pops of red! LOVE it! It's beautiful, looks so cozy and has such a dreamy ambience.